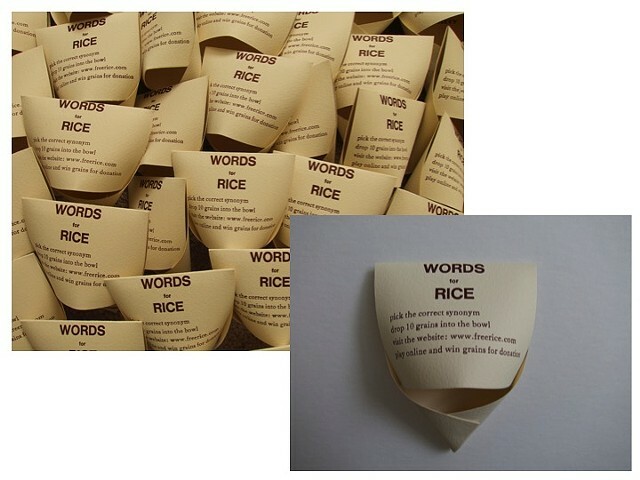 Words for Rice is a physical reenactment of freerice.com's vocabulary games that donate ten grains of rice to the World Food Programme for each synonym guessed correctly. The variable edition of 60 includes four alternating examples, with specified typefaces for the words of choice. The instructions are on the front fold, the answer is on the back, and the participant is encouraged to drop the ten grains attached in the folded bowl accordingly. The project aims to motivated participants to visit the online site and play to donate.